Heat up soup pot with 3 cups of water. Bring it to boil and add in the garlic, pork belly, and dashes of pepper. 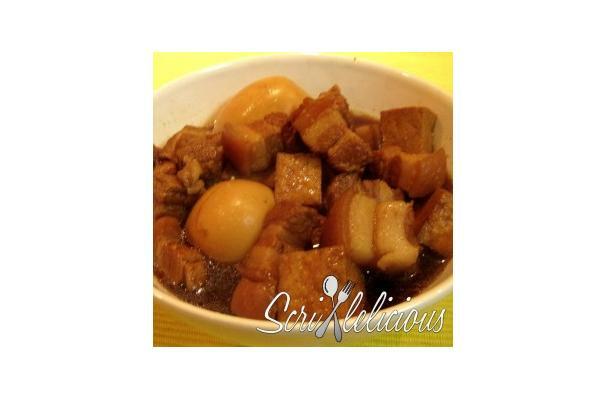 Let pork belly to cook for 5-7 minutes before adding the hard-boiled eggs, fried tofu, soy sauce, sweet soy sauce, and dark soy sauce. Lower heat to medium fire and simmer the pork for 30 minutes or until the pork belly is cooked and tender. Give the pot a stir, allow to simmer on low fire if needed. Scoop to bowl and serve while it’s hot. for those pork and soy sauce addicts out there, do give this recipe a try, even on a lazy tiring day. Best served with steamed Jasmine rice.